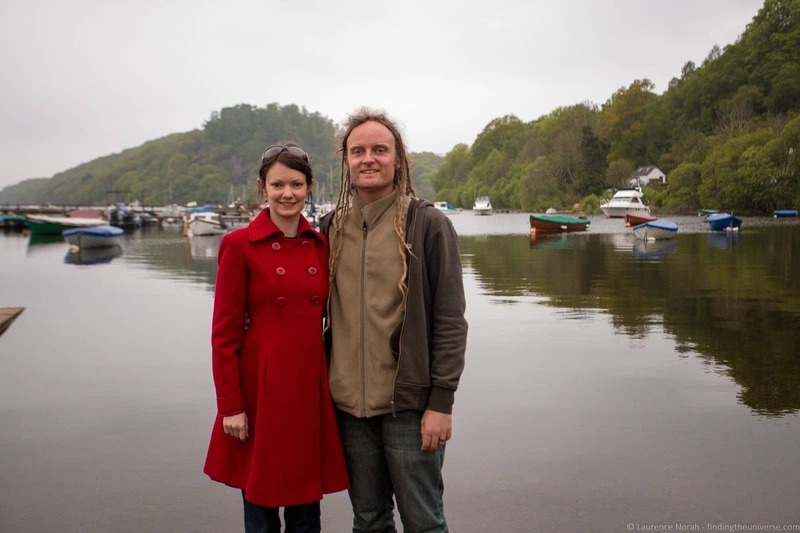 Jess and I were recently invited to visit both Glasgow and the nearby national park called Loch Lomond & The Trossachs. 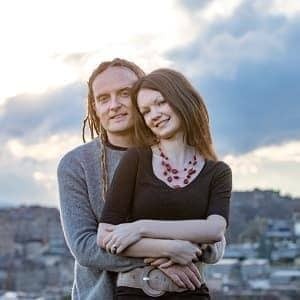 Despite having been based in Edinburgh for over a year, we still hadn’t made it the short distance across to Scotland’s largest city, and we were keen to rectify this omission. 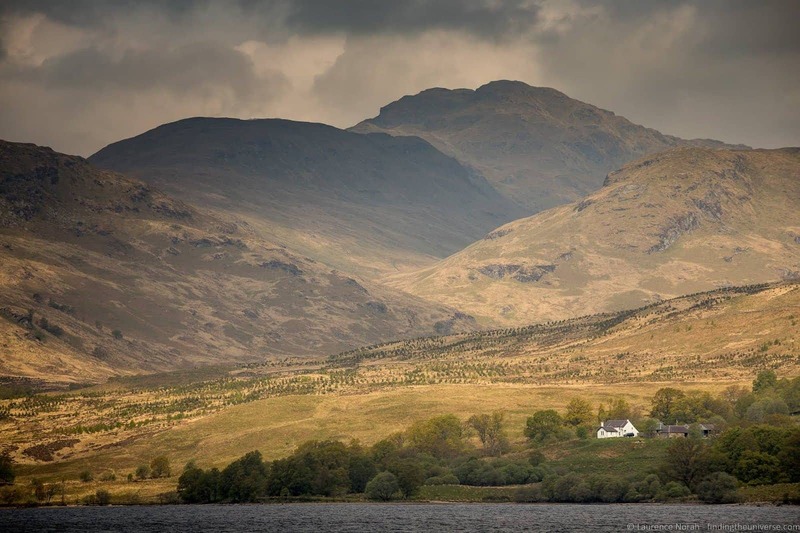 The goal of the trip for me, as you can see from the post title, was to share a perfect itinerary for spending 2 days in Glasgow and the beautiful Loch Lomond & The Trossachs National Park, demonstrating how you can pack more in to even a two day itinerary. We actually spent four days in Glasgow discovering all the highlights, and we’ll be sharing more posts about the city in the coming months across both our blogs to help you plan your perfect Glasgow adventure. Today though, I’m going to be sharing an itinerary that marries the best of both worlds – a city stay with a trip to the country. It’s wonderful how easy it is to get from the bustling cultural attractions of Glasgow up to the natural beauty of the Loch Lomond & Trossachs National Park, and this itinerary will help you do just that! Your first day has you exploring as much of Glasgow as is possible to see in a day. Of course, there’s loads more to see here than you can fit into one day, and I’ve included a few options at the end in case you wanted to swap anything out. As it is though, I’ve put together what I think is a balanced itinerary to help you see the best of Glasgow in just a day. We’re going to start in the oldest part of town, up at Glasgow Cathedral – Glasgow’s oldest building. This is about a ten minute walk north-east of the city centre, and is a good place to start to get a feel for the history of the city. It’s here that the patron Saint of Glasgow, St Mungo, was believed to have founded his church, and he is buried in a crypt underneath the building. The Cathedral is a beautiful gothic construction dating from the 12th century, and has a gorgeous ceiling as well as a lovely vaulted crypt. Near to it across a footbridge you’ll find the Necropolis, a large hillside burial ground, and the immediate area is also home to two museums – Provand’s Lordship and the St. Mungo Museum of Religious Life and Art. The former is housed in Glasgow’s oldest house, dating from 1471, and is now a historic house museum featuring items and artefacts from various time periods. The latter is dedicated to religious life and art, and covers a number of the world’s major religions, with information and artefacts from all of them. When we visited, there was an excellent exhibition on how death is handled in some of the world’s religions. All of the above attractions are free to visit, with donations accepted and appreciated. For opening times and further information check the official websites for each. Right in the heart of Glasgow’s city centre, about a 10 – 15 minute walk down from the Cathedral, you’ll come to the Gallery of Modern Art. Outside of this building is where you’ll find one of Glasgow’s most iconic landmarks, the Equestrian Statue of the Duke of Wellington. As the name suggests, this is a statue of the Duke of Wellington sitting atop a horse. 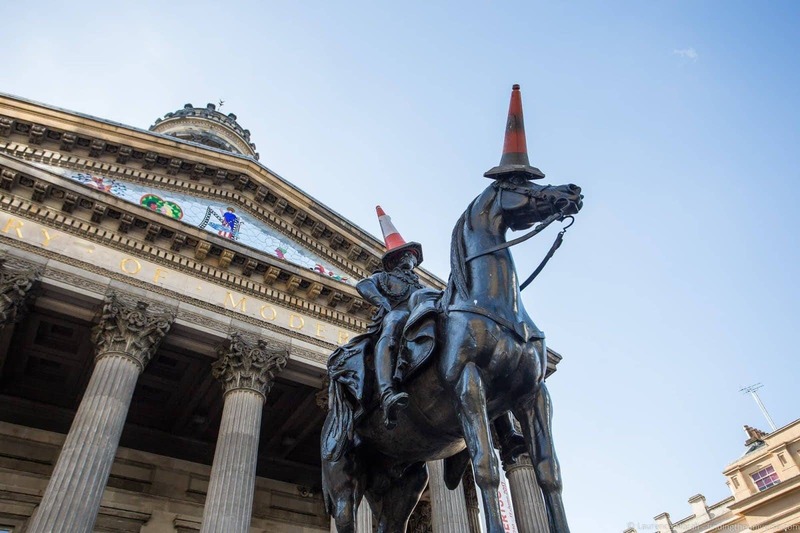 This might not sound too exciting, but the star of the show is the traffic cone that is nearly always to be found on his head – the subject of a long running battle between local government workers and some secretive cone society who continuously re-cone the head of the Duke. It’s probably the most photographed subject in Glasgow, so you’ll definitely want to get a shot of the Duke. Then, you can head inside the excellent Gallery of Modern Art (free, donations accepted). As you walk around Glasgow you won’t be able to miss the incredible huge panels of street art that adorn the sides of city buildings. 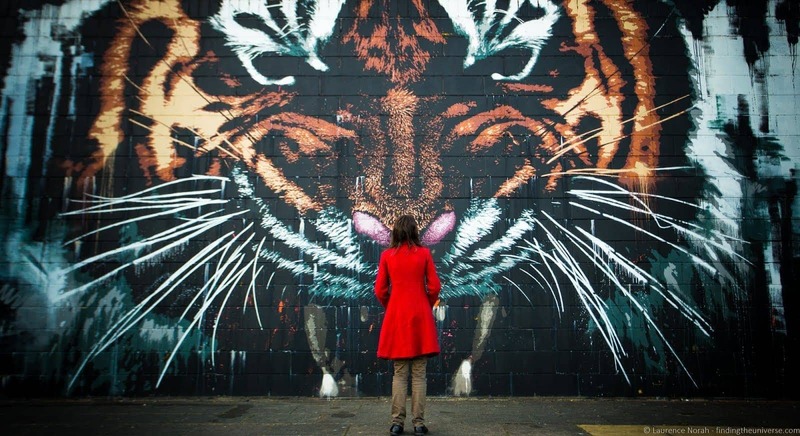 Ranging from giant tigers to spacemen, athletes, and famous Glaswegians, these murals are some of the best street art I’ve ever seen. There’s even a trail you can follow if you’re so inclined, although it will take a bit of time to see them all. I’ve got a post on the street art of Glasgow, if you want to see more. 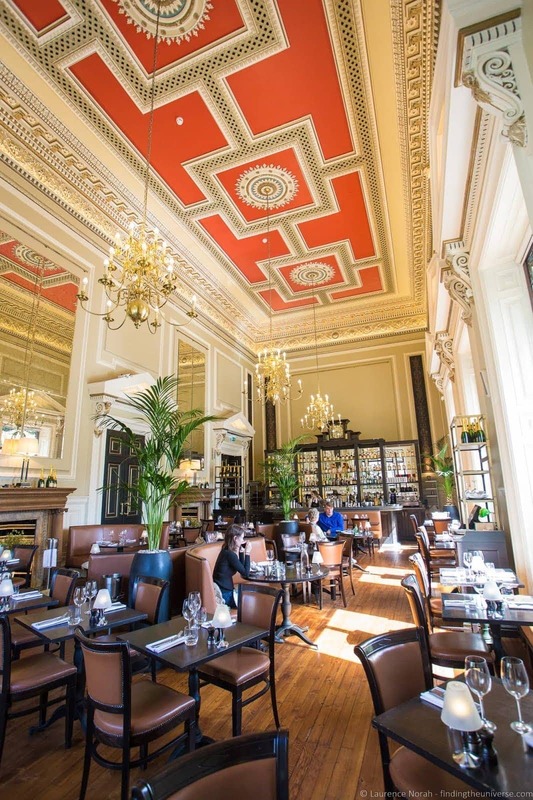 It must be time for lunch by now, and one excellent city centre option that we can highly recommend is the Hutchesons Bar & Brasserie. If it’s a nice day they have outdoor seating, but we would still recommend you head inside to the incredible upstairs dining area with its high ceilings and beautiful decorations. You won’t be disappointed, either by the decor, or by the fantastic food. Now you need to head over to the west side the city to the University. To do so, you can hop in a cab, or take a metro or a bus, and we’ll continue our day. You really can’t visit Glasgow without taking in something designed by one of Glasgow’s most famous architects, Rennie Mackintosh. 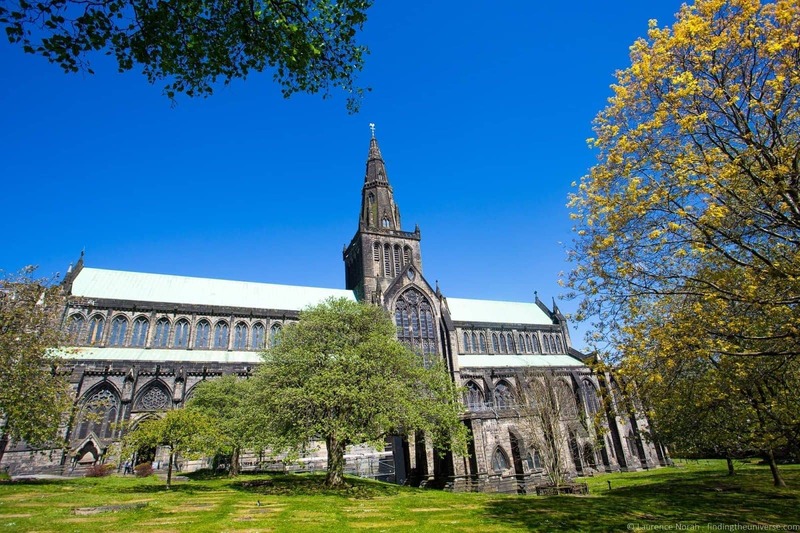 Largely unrecognised during his lifetime, in recent decades the importance of his work has come to light, and there are now a number of properties you can visit around the Glasgow area to see his work in person and learn about his life. Inside, on a tour you can only take with a guide, you will learn about the life or Mackintosh as well as what made his architecture and designs so interesting. You’ll also learn about Margaret McDonald, Mackintosh’s design partner and wife, who was responsible for many of the interior design and artistic elements of the properties and objects they created. Bookings are advised for the tours, and a fee applies. See the official website for tour times and contact details. Whilst you’re waiting for your tour to begin, or after it ends, you can checkout the Hunterian Art Gallery, which is home to Glasgow University’s extensive art collection, where you’ll find a great many watercolors by Mackintosh, amongst other works. Just across the road from the Hunterian Art Gallery is the Hunterian Museum, housed in the impressive neo-Gothic George Gilbert Scott building. This museum is primarily dedicated to the collections of William Hunter, an anatomist and collector. As well as making great inroads into the 18th century understanding of anatomy and obstetrics, he also found time to amass an impressive collection of artefacts. These he bequeathed to Glasgow University, with the idea that it would help improve the students education, and you can now see them in the Hunterian Museum. Do take time to see the coin collection especially, as this is still regarded as one of the finest in the world, although there’s something here for everyone, including Roman Scotland, Egypt and more. Entry is free, see the official website for opening times and visitor information. 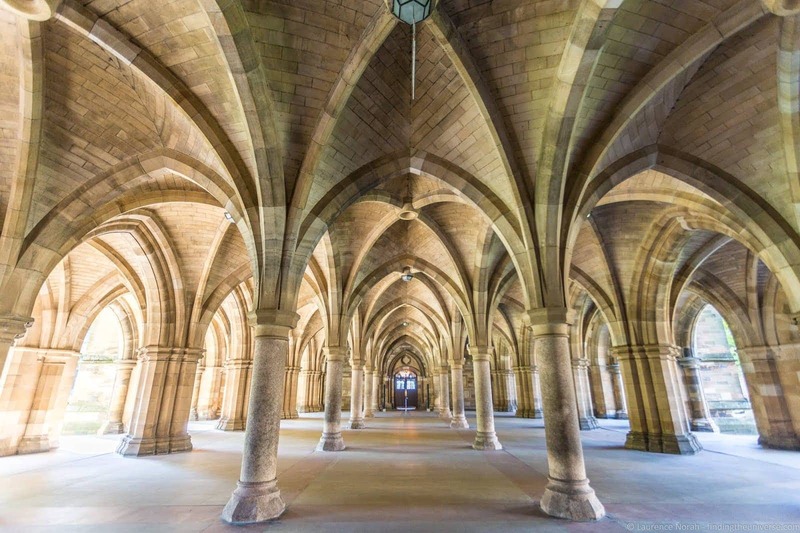 Whilst you are at the Hunterian Museum, do pop downstairs to take a look at the amazing arched cloisters of the George Gilbert Scotland building. These are truly impressive, and deserving of a photo! A 10 – 15 minute walk down the hill from Glasgow University on a well marked route is the incredible Kelvingrove Art Gallery and museum. Originally opened in 1901, this museum is one of Scotland’s most popular free attractions. With over 8,000 objects on display across 22 galleries, you’re pretty much guaranteed to find something to tickle your fancy, with everything from a Dali painting to an original 1944 Spitfire aircraft on display. You could easily spend a whole day here, so we’re going to leave this as the last item on the agenda for the day in terms of sight-seeing. It’s free (you have to pay for parking if you’re driving), and you can see opening times and other visitor information at the official website. You have seen a lot today and travelled far, so we’re going to recommend one of our favourite culinary (and drinking!) 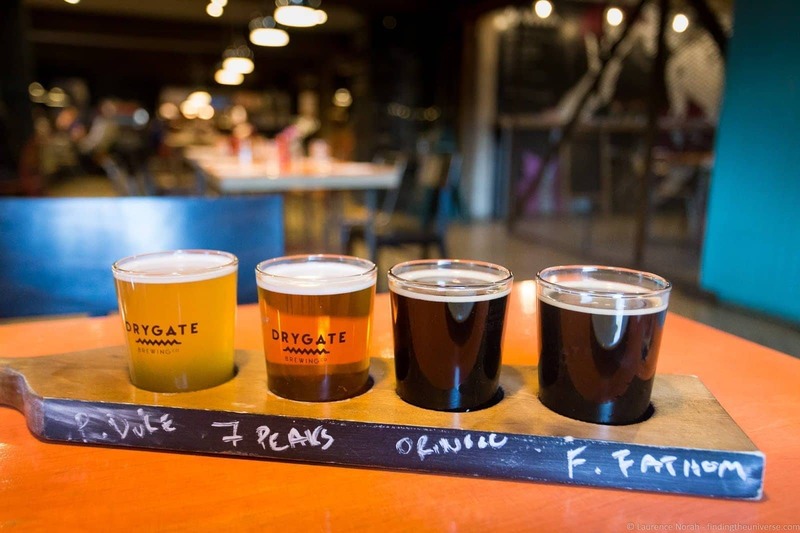 experiences in Glasgow – the Drygate Micro Brewery, which also has an excellent bar and kitchen. This was definitely one of our most memorably meals in the city, and one we can highly recommend. They also brew a range of their own beers on site, and offer brewery tours – check their tour website for dates and up to date prices. Time for a change from the city! The Loch Lomond and Trossachs National Park is less than an hour’s drive from Glasgow, but couldn’t be more different. I’m talking gorgeous lochs, rolling hills, forests, and wildlife. There’s a lot to see and do here, again, far more than a days worth, but here are some highlights to get you started. What better way to start your day in this beautiful part of the world than with a cruise on a steamship that has been operating for over a hundred years? I can’t think of one, so that’s exactly what we did, with a cruise on the beautiful old steamship Sir Walter Scott. 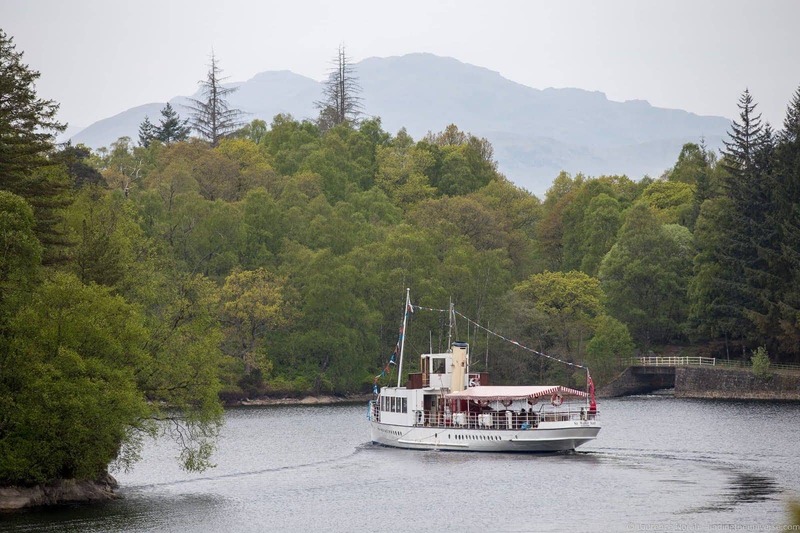 The Sir Walter Scott has been cruising on Loch Katrine since 1900, and while the world around has moved on, I suspect the views and experience are somewhat similar to those experienced by the Victorians who took this boat, way back in the day. The views are magnificent, and experiencing a Scottish loch from the water is a must-have experience. There’s even a bar on-board, should you wish to enjoy a wee dram (or, in our case, a hot chocolate) as you steam across the lake. Sailings are scheduled every day during the season – check this website for times and prices. If you have kids and want to do something exciting with them, then we can definitely recommend a trip to Treezone. This aerial adventure park on the south shores of Loch Lomond at Balloch offers a really fun aerial adventure course with a number of challenging obstacles as well as zip-lines. We’ve done quite a few adventure parks, and this definitely had one of the best safety systems we’ve used so far, we were just clipped in at the beginning and then clipped in at the end – no messing around as we went. This made the whole course very smooth – all we had to worry about was getting across the obstacles. If you’ve got kids, we’re pretty sure they’ll love it (and go faster than you as well!). Check their website for prices and opening times. About an hours drive north of Loch Katrine in the village of Killin are the beautiful Falls of Dochart. 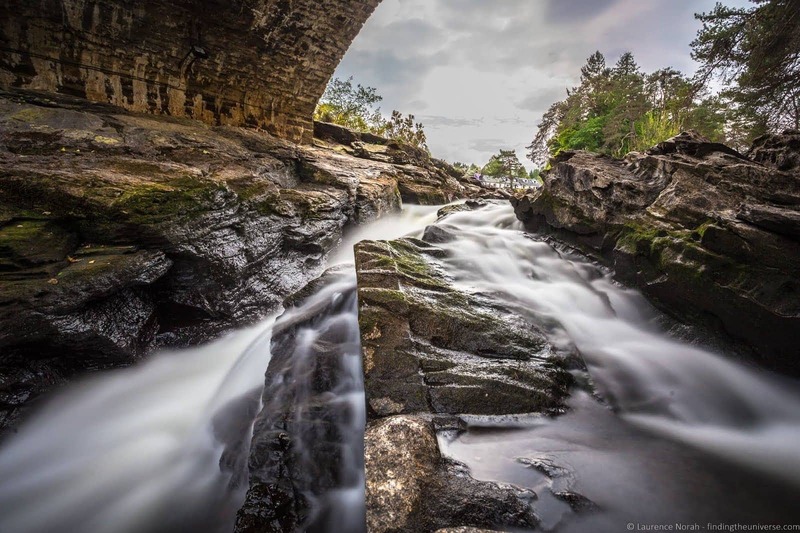 Here you can watch the water as it tumbles around the rocks and under the village bridge, as well as around the islands of Inchbuie, the traditional and ancient burial place of Clan Macnab. One of the photographic highlights of the trip was the deep gorge known as the Devils Pulpit, about a fifteen minute drive south from Loch Lomond itself. 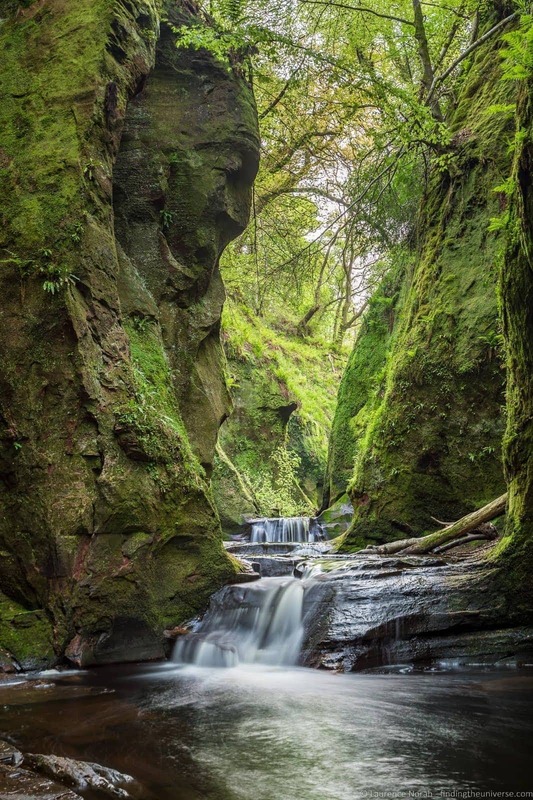 More formally known as Finnich Glen, this deep gorge is famous for the reddish colored water and steep, moss covered walls. To access the gorge you have to park off the road – there are some spaces along the A809. There’s a path that leads off the road and along the gorge, after which there is a very steep set of fairly crumbling stairs down to the gorge floor itself. To get photos of the waterfall, you’re likely going to have to wade through the water, so be prepared for that – I just took my shoes and socks off. Also be aware that the water level can rise rapidly during rainfall, so be aware of weather conditions and be safe. Not recommended in bad weather or after a large rainfall. Here’s a map location of the Devil’s Pulpit to help you out with finding it – car parking and the footpath can be found on the A809 just to the south of where it crosses the river. Additional parking can be found at the junction with the B834 a little further north. 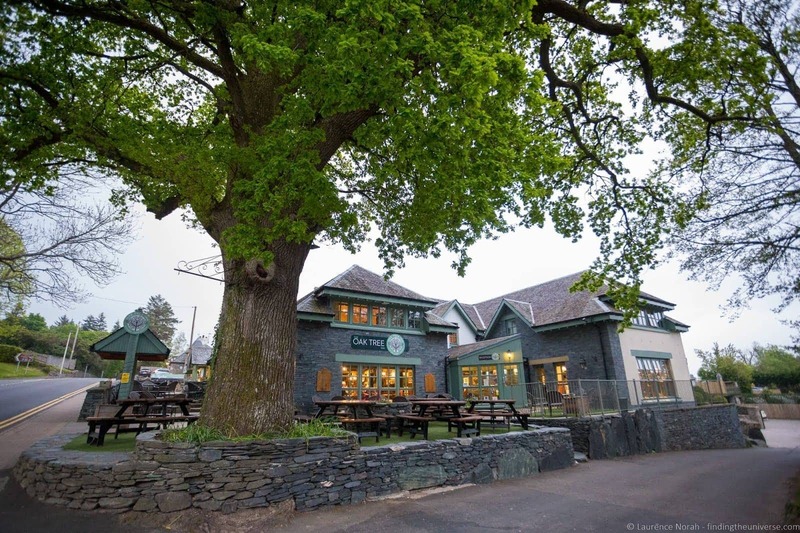 Our last entry for your trip to Loch Lomond & the Trossachs is going to be a meal at the Oak Tree Inn. This is found near the shores of Loch Lomond itself, and if you arrive a little early for your evening meal we can highly recommend taking a short walk along the loch itself. The food varies, but we’ve eaten here twice and were impressed both times by the variety of local produce and Scottish specialties. An excellent way to finish up your two days in Glasgow & Loch Lomond! 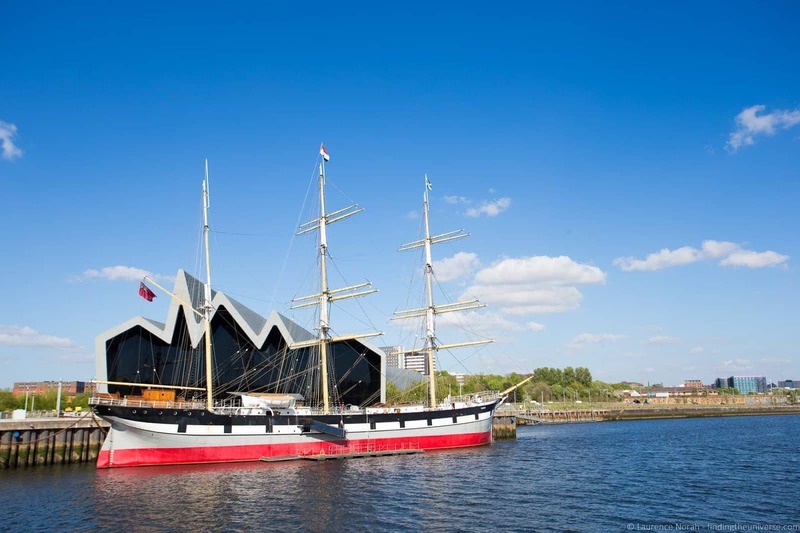 There’s a lot to see and do in Glasgow – far more than is achievable in a day! We’ll be writing some more extended posts about visiting Glasgow and what to see and do, but in the meantime, here are some options that you might consider should any of the above ideas not appeal. If you’d prefer a walking tour of the city with a local expert then we can highly recommend the Walking Lunch tour. Run by Glaswegian food and travel writer Andrea Pearson, this three hour walking tour will take you through 1,000 years of Glasgow history (and food!). 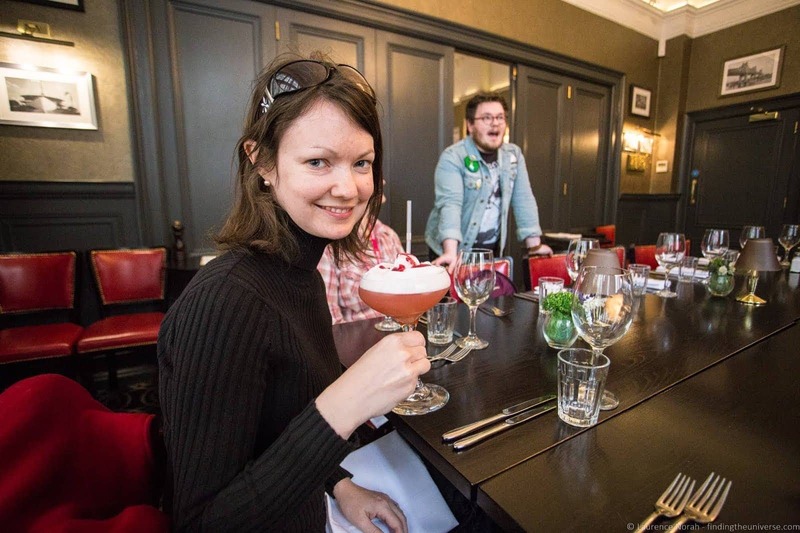 With four courses of local delicacies, loads of information about the history of Glasgow, and even a cocktail / beer & a coffee, this tour is both a lot of fun and excellent value for money. We really enjoyed our tour with Andrea. If you do decide to do this, arrive hungry as it comes with plenty of food, so arrive hungry! At time of writing tours run once a month, check the website for booking information and prices as Andrea mentioned that she may be offering shorter tours more frequently in the future. If you’re visiting Glasgow with kids, they’ll love the hands-on Glasgow Science Centre. Packed full with three levels of interactive exhibits and information panels, this place if a lot of fun for both adults and kids. This is one of the few museums in Glasgow that isn’t free to enter, however we feel that the entry price is more than worth it as there’s so much to do and so many interactive exhibits to have fun with. 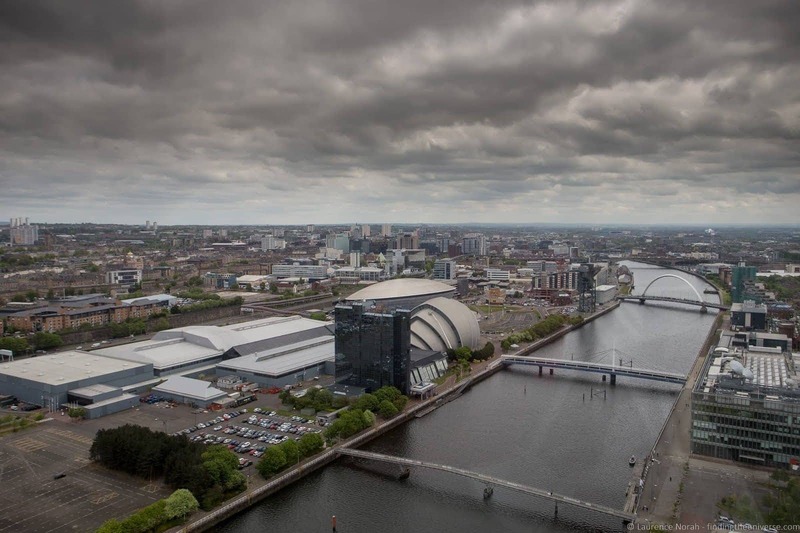 You can also head up Glasgow’s tallest structure, the Glasgow Tower, which is the tallest freely rotating tower in the world. It’s an incredibly innovative building in terms of it’s design, and is well worth the trip up to the top for the view over Glasgow. Another excellent free museum in Glasgow by the riverside is the Riverside Museum. This won the 2013 European Museum of the Year Award, so as you can imagine, is worth a visit. 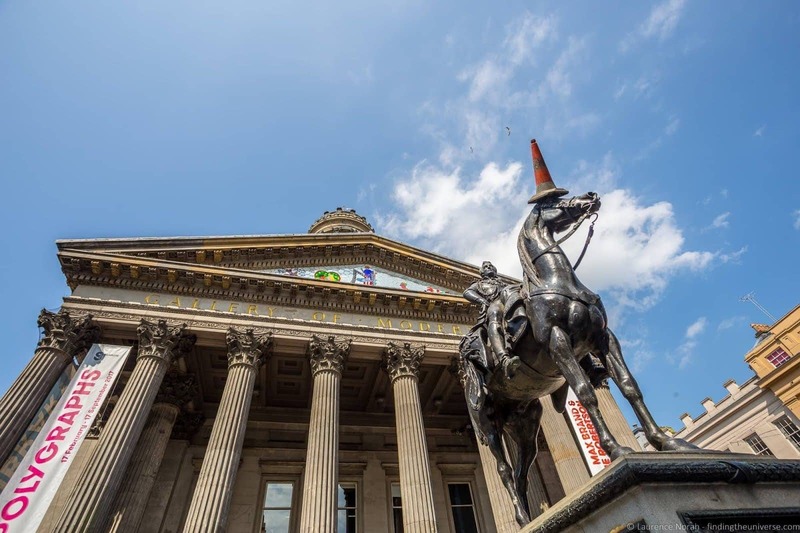 The museum focuses heavily on transport, primarily covering road, rail and sea based transport, as well as the history of public and private transport in Glasgow. It’s stuffed full of real life vehicles, including the world’s leading collection of Scottish built cars and trucks, and fans of transport will definitely want to visit. Right next to the museum is the Tall Ship, which, as you would imagine, features a tall ship that you can tour, also for free. The ship in question is the steel hulled “Glenlee”, an 1896 sail powered vessel built to haul cargo around the world. This is another wonderful experience, giving you an insight into this sort of vessel and an idea of what life might have been like aboard over one hundred years ago. 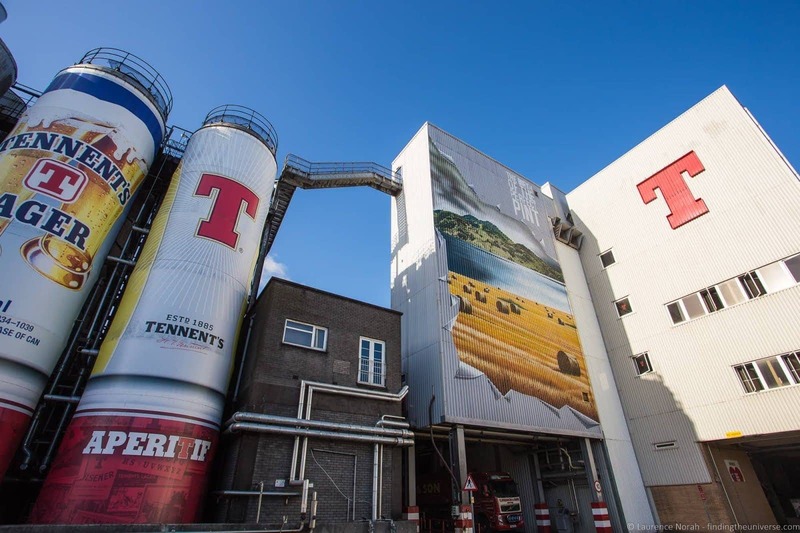 Finally in my list of alternative ideas for your day exploring Glasgow is something a little different – a tour of the Tennents Brewery! Tennents is without doubt the most famous of all the Scottish beers, and a tour of the brewery is an excellent way to learn all about how its made, as well as learn some of the 450 year history of the brewery and the family who started it. Of course, you’ll also get to try some of the beer itself, which is an excellent way to finish a day! Tours run daily and do need to be booked in advance, you can see prices and information at the official website. The brewery is right next to the Drygate micro brewery, which you could visit afterwards for a meal. As part of our research for this post we actually stayed in Glasgow for four nights following by one night in the Loch Lomond & Trossachs National Park. Glasgow has many lodging options, ranging from budget through to upscale. We stayed in an AirBnB in Drygate, which was great value for money and within walking distance of the cathedral and city centre shopping. If you’ve never used AirBnB, you can get up to $100 credit with this link. If you prefer a hotel, then we’d recommend you check out the Glasgow listings on Booking.com. We find they usually have the best selection of properties, including apartments, and are our first go to for accommodation booking when we travel. In the Loch Lomond we stayed at the wonderfully cozy Loaninghead B&B, where we had a truly wonderful room, views over the hills and a magnificent breakfast – served on fine china and sitting on antique furniture, no less. Little touches like a welcoming decanter of sherry in our room were also much appreciated. If you’re looking for something a little bit special, this is an excellent option. One of our favourite times of year to travel in Scotland is May and June. 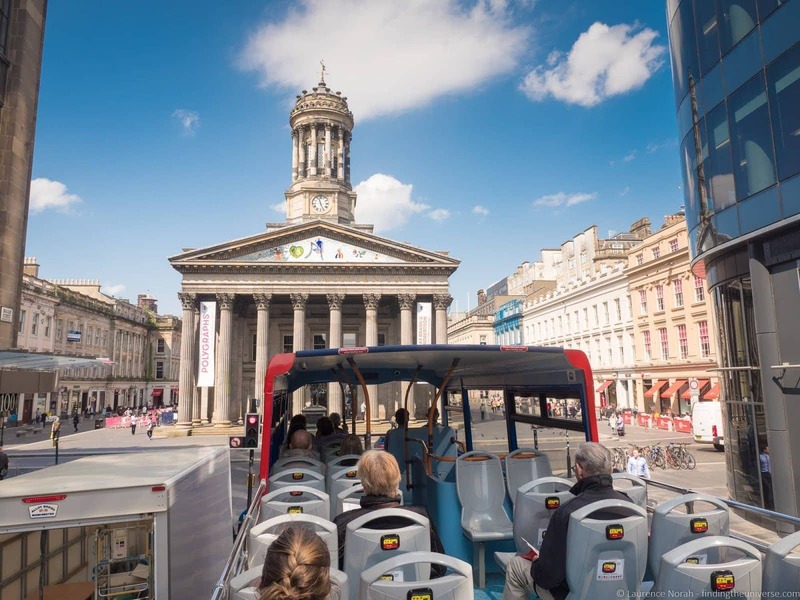 The weather is generally going to be better than in Winter or Spring, the days are wonderfully long, and the destinations aren’t so crowded – although Glasgow is certainly less crowded over the summer than Edinburgh. Overall, anytime of year is fine to visit Scotland, as the weather can be so variable. You can have glorious sunshine in winter and terrible weather in summer. Generally it will be warmer in summer and colder in winter, but we’d suggest just checking the average temperatures for the month you want to visit, and bringing plenty of layers and some form of waterproofing, whatever the time of year! Glasgow has an excellent public transport system which includes buses and a very easy to use metro (there’s only one line and it goes in a circle, so you can’t get lost!). There are also taxis of course. If you want to be sure to visit all the sights, then there’s a hop on hop off bus that will take you to all the highlights in the city, and we used this on one of our days. It’s great value too, plus the commentary is good for learning a bit about the key sights. From Glasgow to Loch Lomond there is a ScotRail train service which takes around fifty minutes, however, to see all the sights I’ve listed in this post I’d recommend hiring a car, as public transport can take somewhat more time and you won’t be able to see as much. We’re almost done with this post on visiting Glasgow & Loch Lomond! Before you go though, I just wanted to share some further reading to help you plan your visit to this area and the wider UK. 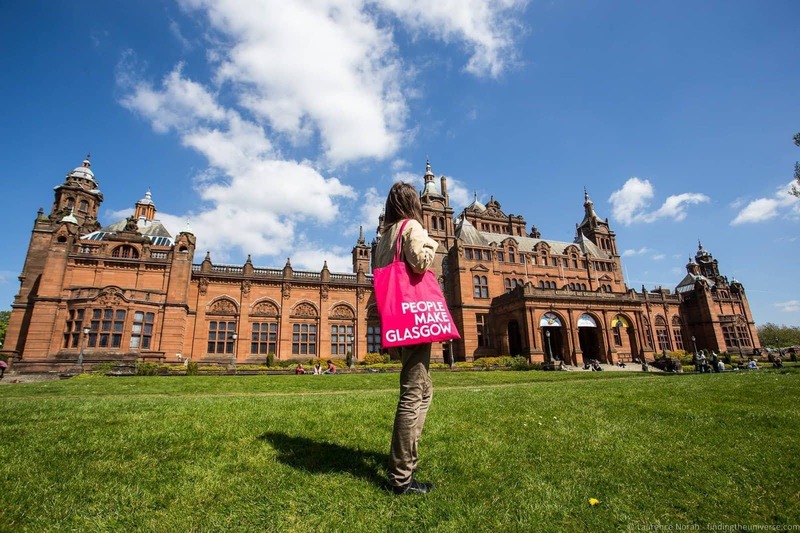 For more information about visiting Glasgow and Loch Lomond, check out the official Pack More In website, which has lots of practical information and tips for your trip, as well as the Love Loch Lomond site. If you’re visiting Glasgow, we’re sure you’re also thinking of visiting Edinburgh too. Check out our guide to spending two days in Edinburgh, as well as getting off the beaten path in Edinburgh. If you’re a Harry Potter fan, you’ve got to check out Jess’s Guide to the Best Edinburgh Harry Potter locations. If you were thinking of taking a trip around the UK and want to include Glasgow as part of that itinerary, we have both a one week itinerary of the UK and a two week itinerary of the UK for you to give you some ideas for what’s possible in those timeframes.. Heading further out of the city? How about a trip to the Scottish Borders or a tour of some Whisky distilleries? 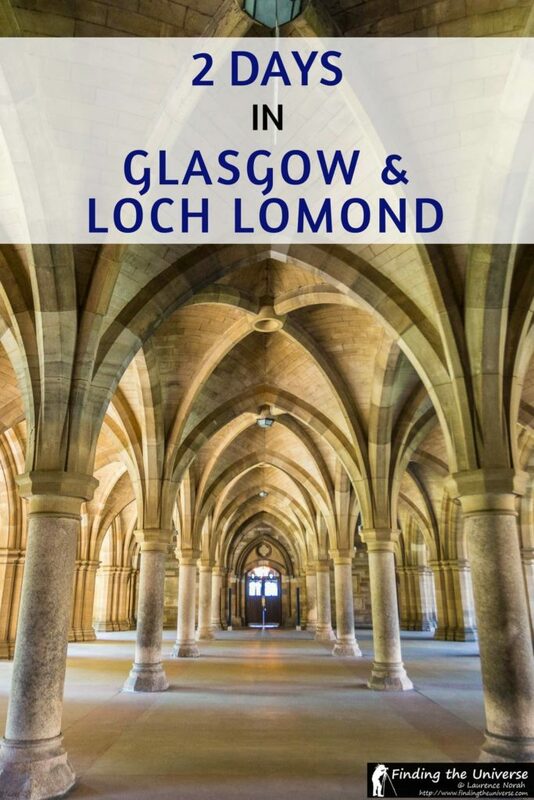 And finally, if you want a guidebook to bring along with you, here’s a Rick Steves guide to Scotland as well as this Insight Guide to Glasgow to help get you started! And that sums up our suggestions for spending two days exploring Glasgow and Loch Lomond! Have you ever visited either of these areas? Are you planning to in the future? Let us know if you have any questions or feedback in the comments below! 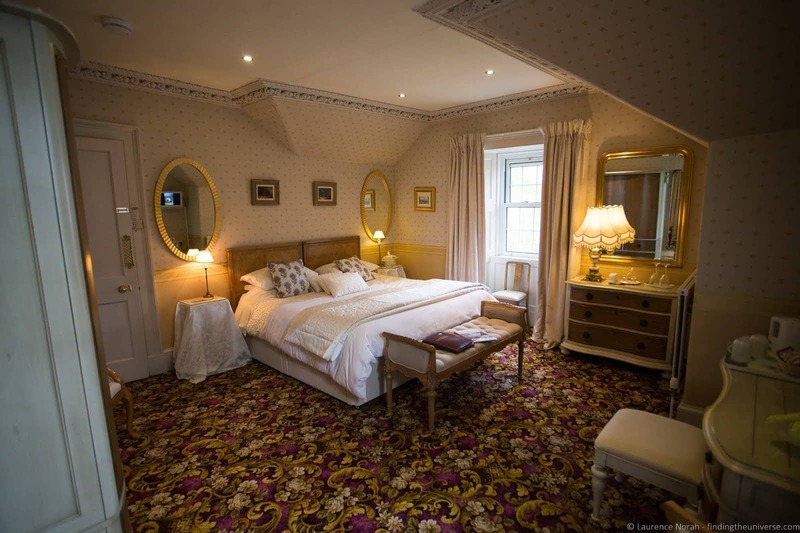 So you know – People Make Glasgow and Loch Lomond & The Trossachs covered some of our activities and meals in Glasgow and Loch Lomond, as well as one night’s accommodation in the Loch Lomond area. We covered all other expenses ourselves including transport, meals and accommodation. As always, our opinions are our own – see our code of ethics for more on how we work with people. This was such a fabulous surprise! We are planning a trip to the U.K. and this is a perfect place to start! Your time lines, traveling and weather suggestions are fabulous!! My friend and I look forward to navigating your site even more! By the way, your pictures are incredible. I hope I get some half as beautiful when we go.